Silk's origins make for an enchanting history. As the story goes, a Chinese empress was sipping tea under a mulberry tree when a silkworm's cocoon fell into her cup and began to unravel into a beautiful shimmering thread. Since then the Chinese have used silk fabric for clothing, arts and decor. 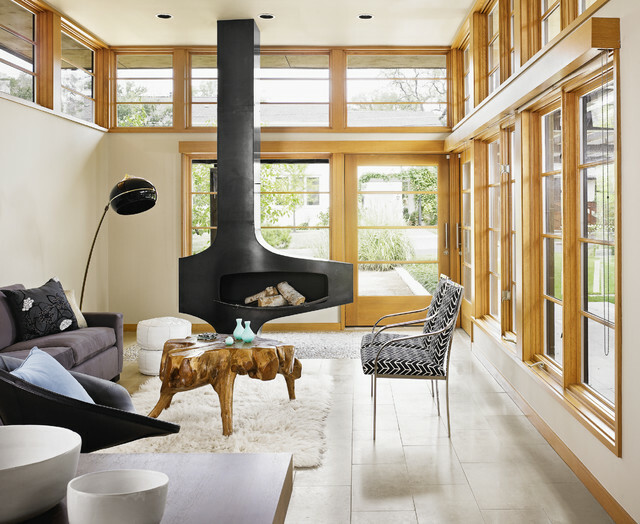 If you're considering installing a fireplace, a freestanding model can be a good pick. It can be installed for much less cost than a full fireplace wall since it generally won't have a stone fascia, lights, or millwork. Styles range from simple and pragmatic to stunning modern designs that serve as sculpture as well as a primary heat source. Pittsburgh interior designer Alisha Gwen allowed her spirited persona to shine through in this show house in Cranberry Township, Pennsylvania. Her mission was to highlight key features of the home while opening potential buyers' minds to the unabashed use of color. She stands by her belief that color is for everyone; people just have to find the right color for them.